(NEW ORLEANS) A trend sweeping the west, originating in Hawaii, has shown no sign of slowing down and has now made its way to New Orleans. Poke Loa has introduced Nola to it’s first poke bowl with their first location opening on 3341 Magazine St., New Orleans. 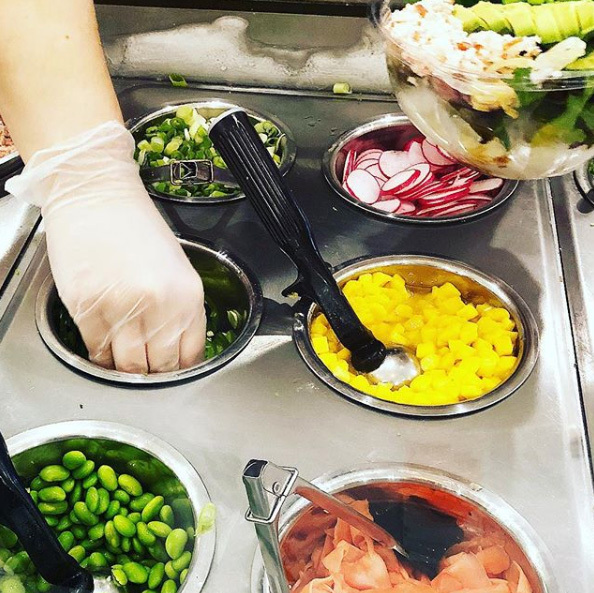 The word “Poke” comes from the Hawaiian word meaning “to chop,” originated when fisherman would take a break and mix chopped fish with other local ingredients. It was popularized in Hawaii because of its fun, fast and delicious style. When you walk into Poke Loa, it offers a clean, fresh feeling with a beautiful white modern design. The walls are large windows that bring in tons of natural sunlight on bright New Orleans’ days. It is a walk-down-the-line-and-pick-what-you-want style of restaurant. With a multitude of fresh ingredients to choose from, there is something for just about anyone here. I like to load my bowl down with lots of fresh ingredients including a brown rice base, with a chopped tuna and spicy tuna combo, topped with sweet onion, cilantro, tamari (soy sauce substitute), ponzu, chili paste, sesame oil, seaweed salad, green onions, avocado, fresh jalapeno, crab salad, orange and red tobiko (fish eggs), and finished off with a drizzle of sriracha and lemon miso aioli. When complete, it looks more like an art piece rather than a meal. The beautiful display of colors from the light green avocado to the pearly orange and red tobiko add so much flair to the dish. Each bite from this bowl has a different fusion of flavors and textures. All the fish was very fresh and tender, as each bite melted in your mouth. The tamari and ponzu added the saltiness to the dish, while the chili paste and sriracha aioli added that garlicky spice we have all come to love. The jalapenos were significantly less spicy but, since they were fresh, a nice crisp was inserted into the meal. Every ingredient adds such a unique flavor and texture to the bowl that when it is done being assembled, it is masterpiece of your own creation. Because of its artistic layout, fresh and delicious ingredients, and overall beautiful finished product, I give my last rating as a St. Paul’s journalist a 10 out of 10. This is my the last time writing for The Paper Wolf. It has been a wonderful experience tasting the flavors that Covington, Mandeville, New Orleans and New York has to offer. I hope that someone with the same love of food and culture fills my shoes. Keep living, keep loving, keep eating.